These holidays would be full of good flavours and aromas from the table. We suggest our specialities combined in genuine and precious gift ideas emphasizing our territory and gastronomy. The proposals for Christmas 2018 are created specifically to leave a mark, expressed in the precious olive wood veining and in the beech curving. The resulting cutting boards and pestles are handcrafted by ingenious and creative local artisan. From Tuscia the organic products exhort to the slow savouring, life, and the local history that is behind every taste, in transparent packs like us. Inside there is also a recipe book of main and second courses, to learn and above all to let be tempted by new menus. 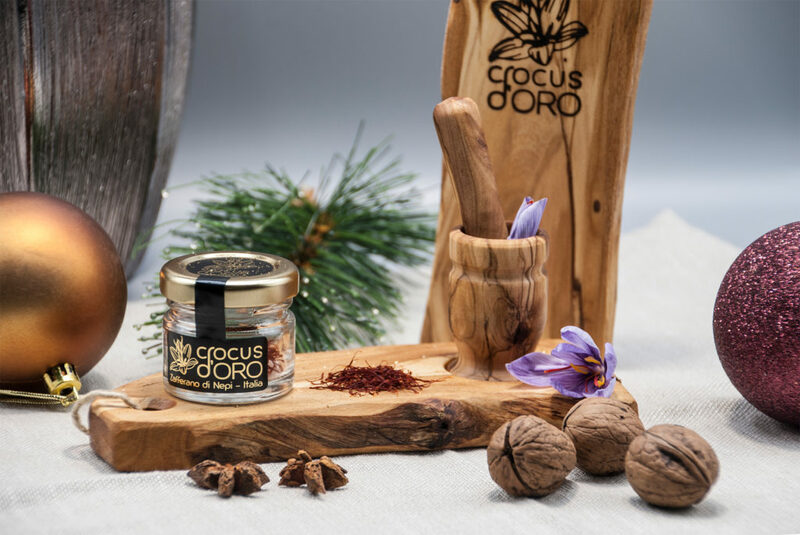 The common denominator is the pure Crocus d’Oro saffron pistils, hand-harvested and dried slowly at low temperatures. Few threads to give stimuli and energy for highly tasty and appreciated meals, this is an invitation to originality and tradition of centuries of spices, oil, but also the local beers that embrace the notes of contemporaneity and special ingredients. 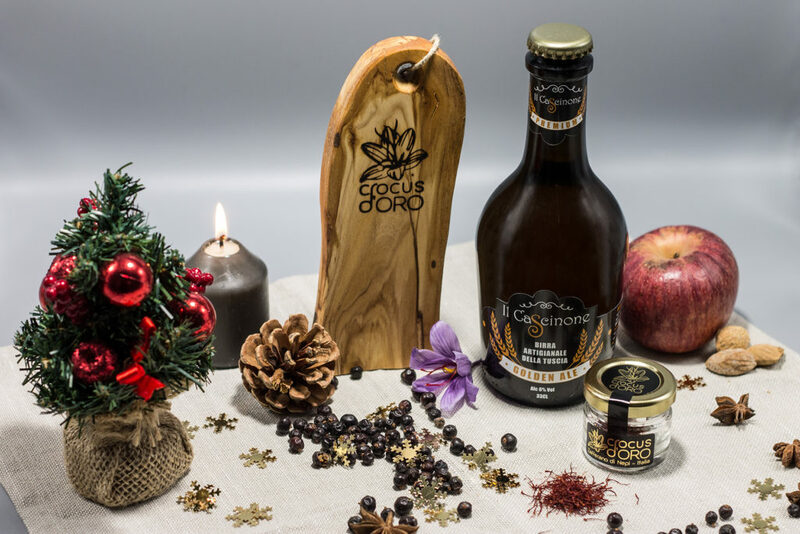 Six combinations to collect based on saffron pistils of Nepi, craft beer Cascinone Golden Ale refined with our spice, and finally the extra virgin olive oil Cascinone belonging to the Lazio region upper category. All strictly made in Italy. 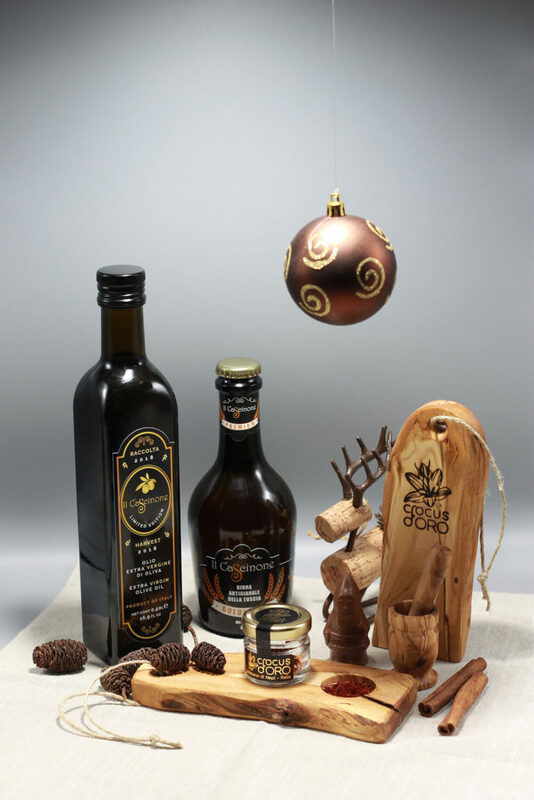 Our gift ideas evoke atmospheres of high-quality craftsmanship, good and healthy foods. For info and orders, please visit the Contacts page. Dear and future friends, I wish you all the very best. Panettone and organic saffron. The red gold of Tuscia.